ww2dbaseAs the Japanese defenses crumbled in central Burma, two separate forces raced for the glory of capturing Rangoon, the capital of the British colony. At Ceylon, Allied Supreme Commander Louis Mountbatten backed his Operation Dracula plan, which called for an amphibious assault on Rangoon. Meanwhile, General William Slim urged his troops to advance rapidly from central Burma as the final phase of his Operation Extended Capital plan. 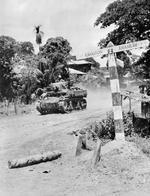 Slim's advance largely consisted of two Indian mechanized infantry divisions, the 5th and the 17th, both of which moved so fast that, on several occasions, they caught Japanese defenders unprepared. On 21 Apr 1945, Mountbatten announced that Operation Dracula was to be executed on 2 May, thus concretely setting a goal for Slim. Slim's offensive captured Toungoo, Penwegu, Daiku, and Allanmyo successively in the final week of Apr, while they also accepted the surrender of the 3,000-strong Japanese-sponsored 1st Division of the Indian National Army at Pyu, Burma on 23 Apr. On 27 Apr, British transports with Lieutenant General Philip Christison's Indian XV Corps aboard departed from Akyab and Ramree Islands in Arakan in western Burma, while the powerful British East Indies Fleet sailed from Trincomalee, Ceylon, setting Operation Dracula in motion. On the next day, 28 Apr, Slim's Operation Extended Capital met strong Japanese resistance at Pegu, which was designed by Japanese Major General Hideji Matsui to be the final stronghold north of Rangoon. The troops of Indian 17th Division captured Pegu, but they failed to secure it immediately. On 1 May, paratroopers of the Indian 50th Parachute Regiment dropped in the Rangoon region. Knowing that the bulk of the remaining Japanese forces in the Rangoon region had been wiped out at Pegu, Slim carelessly ordered his American pilot Captain Robert Fullerton to fly him and a small staff over Rangoon airspace so that he could claim to be the victor of the race. Japanese anti-aircraft fire peppered the aircraft, forcing them to turn back; Fullerton was wounded by shrapnel in the leg, and the injuries were so extensive that the leg would ultimately be amputated. On 2 May, as the Indian 17th Division began to cover the final 41 miles to reach Rangoon, Operation Dracula landed Major General Henry Chambers' Indian 26th Division, which would capture the city on the next day with minimal resistance. Mountbatten's Operation Dracula had beaten Slim's Operation Extended Capital in the race for the Burmese capital. ww2dbaseAs early as 23 Apr 1945, the Japanese leadership in Burma had already known that Rangoon could not be held. Lieutenant General Hyotaro Kimura, despite orders to hold his ground from his superiors in Tokyo, ordered the evacuation of Rangoon to Moulmein across the Gulf of Martaban; this caused much confusion as he failed to provide the necessary details to keep his subordinates calm. Major General Matsui, defending Pegu, was furious at Kimura, who failed to communicate the evacuation order to the Pegu garrison until it was too late for Matsui to fall back. ww2dbaseOn 6 May, the Battle of Rangoon officially ended as the Indian 26th Division made contact with the Indian 17th Division near Hlegu. The Allied offensive in Burma was generally regarded as over at this point, although fighting would continue as Anglo-Indian troops, British aircraft, and American aircraft continued to harass the Japanese troops attempting to escape Burma into neighboring Thailand. Meanwhile, many Anglo-Indian units saw their role converting to police duty, at least in May and Jun 1945, to contain the widespread looting and vigilantism that took place in Rangoon after the Japanese evacuated. 2 Apr 1945 Louis Mountbatten announced that the planning for Operation Dracula against Rangoon, Burma was to be resumed, with a target execution date of 5 May 1945 at the latest. 11 Apr 1945 Anglo-Indian troops captured Pyabwe, Burma at dawn; 2,000 dead Japanese bodies were counted in the region after the fierce battle. To the southwest, mechanized Anglo-Indian troops reached the Taungdwingyi area. 14 Apr 1945 Anglo-Indian troops captured Taungdwingyi, Burma. 16 Apr 1945 Indian 5th Division captured Shwemyo, Burma during the day, while by nightfall the Anglo-Indian 4th Corps reached within 240 miles of Rangoon. 21 Apr 1945 Louis Mountbatten scheduled Operation Dracula against Rangoon, Burma for 2 May 1945. William Slim hastened his units overland toward Rangoon in an attempt to reach Rangoon before Dracula commenced. 22 Apr 1945 In Burma, Indian 7th Division attacked Yenangyaung while Indian 5th Division attacked Toungoo. 23 Apr 1945 The 150 officers and 3,000 men of the 1st Division of the Indian National Army, an anti-British resistance group aided by the Japanese, surrendered to the Allies at Pyu, Burma. Meanwhile, Lieutenant General Heitaro Kimura, despite having been given orders of defend Rangoon, Burma to the death, ignominiously abandoned the city without issuing any orders to the Burma Area army. 24 Apr 1945 Indian 5th Division captured Toungoo, Burma and advanced further to Penwegu. 24 Apr 1945 The final 50 troops of the all-female Rani of the Jhansi Regiment loyal to Indian nationalist and Japanese collaborator Subhas Chandra Bose withdrew from their base in Rangoon, Burma for Bangkok, Thailand. Two women were killed by a British advance patrol. 26 Apr 1945 Indian 17th Division reached Daiku, Burma. 27 Apr 1945 The British East Indies Fleet sailed from Trincomalee, Ceylon to begin a series of strikes prior to the capture of Rangoon, Burma; this force of battleships, cruisers and destroyers would take it in turns to fuel and then screen the carriers hitting airfields, installations and coastal shipping in the Nicobars, the Andamans and along the Burma coast. Meanwhile, on land, Indian 17th Division was attacked by a Japanese suicide offensive north of Pegu; it was repulsed after the Japanese suffered 500 killed. 28 Apr 1945 Anglo-Indian troops captured Allanmyo, Burma. Elsewhere, Indian 17th Division reached the heavily-defended Pegu, where the Japanese built the final major stronghold north of Rangoon, which was 47 miles to the south. 29 Apr 1945 The two-prong assault by Indian 17th Division on Pegu, Burma was repulsed. 30 Apr 1945 Anglo-Indian forces gained a beachhead on the west bank of the Pegu River at Pegu, Burma. 1 May 1945 Indian 50th Parachute Regiment was dropped near Rangoon, Burma as the spearhead to Operation Dracula. Meanwhile, determined to preempt Operation Dracula in the conquest of Rangoon, William Slim carelessly attempted to enter the city himself by air; his aircraft was damaged by Japanese anti-aircraft fire and the American pilot, Captain Robert Fullerton, sustained injuries in his leg so severe that it had to be amputated later. 2 May 1945 In Burma, Indian 26th Division and Indian 17th Division continued their competition to be the first division to reach Rangoon. The 26th Division made an amphibious landing near the city, while the 17th Division secured Pegu. The first individual to enter Rangoon, however, was an RAF officer who landed on a nearby airstrip on this date. He walked into the city and, having assured himself that the Japanese had really gone, sailed down the river in a commandeered sampan to meet the troops advancing from the south. 3 May 1945 Rangoon, Burma was captured by Indian 26th Division with little resistance. Fleeing Japanese were slaughtered not just by British and Commonwealth troops but by Burmese guerrillas and tribesmen who rose up against their former occupiers. 6 May 1945 In Burma, Anglo-Indian XV Corps linked up with IV Corps, which had been advancing down the Sittang River, and effectively cut off 20,000 sick, hungry and increasingly desperate Japanese from their bases in Indo-China. 30 May 1945 The remainder of General Seiei Yamamoto's troops in Burma was effectively wiped out. 28 Jul 1945 The remaining 27,000 men of the Japanese 28th Army in Burma began marching for Thailand. They would be harassed by aircraft from above and British troops and local tribal guerrilla fighters on the ground along the way. The crossing of the Sittang River alone would see more than 13,000 casualties, most of whom either wounded or killed by machine gunning or drowned in the current. Lt.Colonel Brian Montgomery (the Field Marshals brother) took the surrender of Lieutenant-General Hondas 33rd Army at the conclusion of the War with Japan. A Japanese Army however (like the Russians) was only the equivalent size as a Anglo-American Corps and by the time of the surrender General Hondas force is estimated to have shrung to as few as 8,000 men or less. one contributing factor as to why general Slims forses did not occupy Rangoon before Dracular was the monsoon broke whilst the forces were at Pegu and all transport sank into the mud. The rain was torrential- slit trenches filled up overnight- nothing could move.